"A must see bee movie"
Wasp Removal is similar to bee removal in many ways. 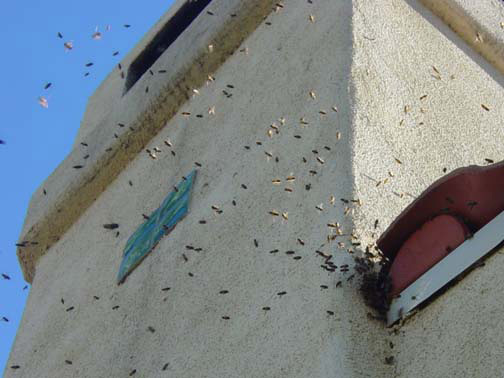 A wasp will build a nest on the eaves of a building or in an irrigation box just like bees. The real problem is that the nest is often made of mud or another material that will stain the stucco or siding of your structure. Early removal will keep your home looking its best. A wasp can sting several times unlike a bee. The wasp stinger does not stay in its victim, but merely injects a single dose of venom. This gives it the ability to sting over and over again. The main difference between a wasp and a bee is its diet. A wasp eats other insects unlike a bee that eats pollen and produces honey to store as food. "Sometimes you get stung just walking up to ring the door bell." Fast and effective same day bee removal! Only the girl bees sting. Bees can fly up to 13 mph. watch them in our bee movies. A bee can recognize your face. Bees rarely fly in the rain. A bee dances to give directions. Bees navigate using the sun. 1. Scroll down and look at the photos. 2. Identify your bee problem. 3. Call for pricing and bee removal today! 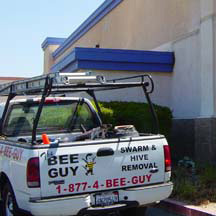 The Bee Guys offer same day bee removal and wasp control service for all Los Angeles residents. Whether you are experiencing a bee problem for the first time or dealing with a reoccurring problem, The Bee Guys are here to help! Our technicians have performed bee removal for local residents, businesses, property managers and municipalities for over sixteen years. Local year round temperatures are well suited to bees and contribute to the growing wild bee population in Los Angeles. 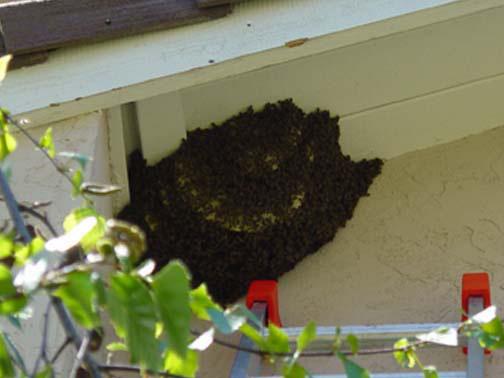 The Bee Guys perform hundreds of bee removals and swarm relocations within Los Angeles each year. After completing your bee removal, we can box the bees for use in crop pollination. 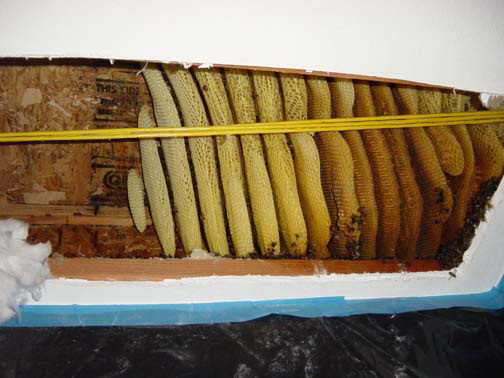 The Bee Guys remove bees from trees, landscaping, roofs, walls, attics, fireplaces, sheds, cars, boats, personal residences and commercial buildings. Don’t see your bee removal problem listed? Give us a call or e-mail us at 4beeguy@gmail.com . 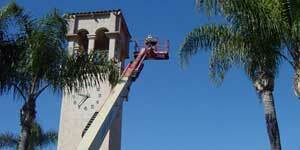 We also service radio and TV antennas, cell towers, church steeples and other difficult to access locations. Over the years we’ve performed many challenging bee removals and are always looking for something new to showcase in one of our videos. Please take a look at The Bee Guys Bee Swarm video in the Bee Removal Movies section. You won’t believe what these little bees can do! Thanks for visiting our bee removal website. 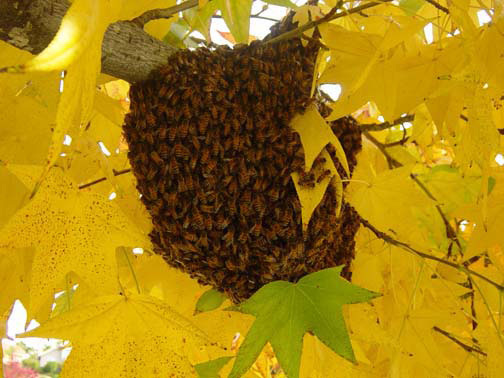 The average bee swarm consists of ten to twenty thousand bees and a mature hive can grow to over forty-five thousand bees. We relocate hundreds of swarms and hives each year. The Bee Guys have years of bee removal experience and can manage gentle or aggressive bees for you without incident. 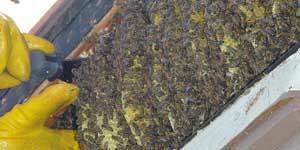 Over seventy percent of the bees we remove are now Africanized hybrid bees. Africanized bees have been responsible for many injuries to people and their pets. With early detection and relocation of wild bee swarms and hives, we may be able to manage the Africanized bee threat. Please do not approach bees, they may feel threatened and respond in a hostile way. 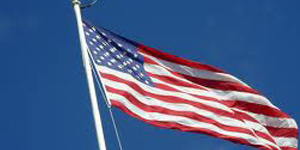 The Honey Bee was brought to America by the first settlers. You have probably heard of the KILLER BEE (Africanized), Italian bee or European Honey Bee. What about the American Bee? Bees are not an indigenous species of the United States but have become an integral part of our ecological system. The honey bee is now found all over the continental U.S. Hives consist of three types of bees, the Queen Bee, the drone bee and most common in a hive, the worker bee. Although bees can be beneficial, such as pollinating an almond grove, a bee hive in the wall of your home is not. Watching bees build a hive can be interesting, but bees are easily angered and pose a threat to people who are unaware. Always use caution as a first rule around bees! The Bee Guys, Bee Removal and Wasp Control Service. Content Copyright 2011 The Bee Guys. All rights reserved.